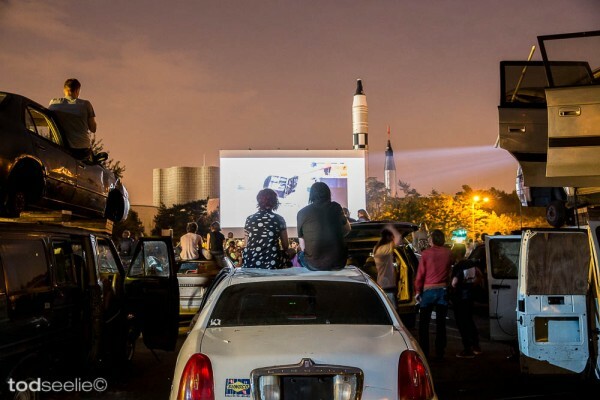 Empire Drive-In is a full-scale, twelve-night, outdoor cinema and social spectacle. Hosted by the New York Hall of Science, and brilliantly programmed and designed by artists Todd Chandler and Jeff Stark, this project is an ambitious statement on upcycling and participatory culture seen through the defunct theater of suburban drive-in entertainment. 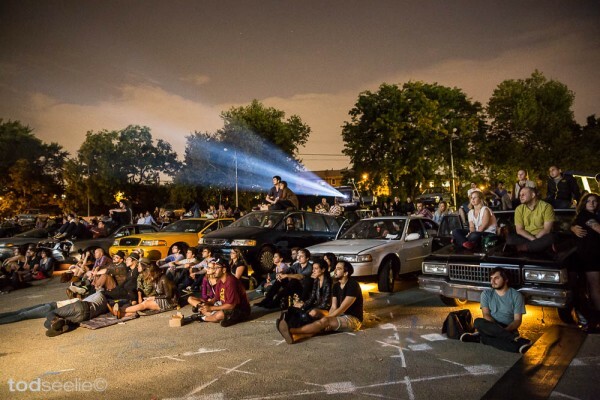 The creation of public and private space is another big picture idea that plays into the experience of Empire Drive-In. Sitting an early aughts BMW on the evening of my visit, I found traces of the previous owners scattered around the car, purposefully left behind by the artists. A wallet-size studio portrait of two young children and an ATM receipt with a balance for little more than $9.00 created a humanizing and intimate fantasy of these earlier occupants. The private narrative unfolding in the car was met on the other end with the larger, public narrative taking place outside, as people moved around, socialized, bought popcorn from the snack bar, and lounged on the hoods and roofs of cars. This division between public and private has always been part of the haphazard choreography of the drive-in theater, though here these narratives feel more direct and curated for personal discovery. In addition to the social concepts it tackles, letâ€™s not forget that Empire is essentially a series of film screenings; a program that is thematic, collaborative, and diverse â€“Â including a Bollywood Bash, Jim Jarmusch’s Night on Earth (1991), and silent films. I attended the Teenage Wasteland double feature, with screenings of Over the Edge (1979) and Suburbia (1983), both about the uprising of white youth in the face of oppressive and alienating suburban communities; a rebellious delight. The films were preceded by a presentation of Stephen Mallonâ€™s impressive documentary photographs of scrapped subway cars in the process of becoming artificial underwater reefs, tying into the spaceâ€™s larger theme of industrial re-use â€“ though hanging somewhat awkwardly in relation to the rest of the eveningâ€™s programming. RVIVR, an energetic punk foursome from Olympia, WA played a set during intermission, giving the crowd another opportunity to gather before heading back to our cars. 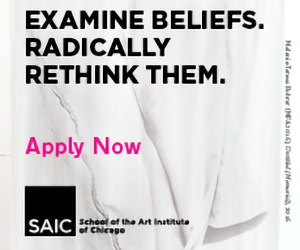 While participation plays heavily into the artistsâ€™ thinking about this work â€“Â as it also does with Starkâ€™s otherÂ â€œunauthorizedâ€ eventsÂ in which complicity is an unambiguous, horizontal requirement â€“ true, active participation at Empire feels optional. Interaction is certainly encouraged here, but some may simply go for a controlled, car-bound experience. 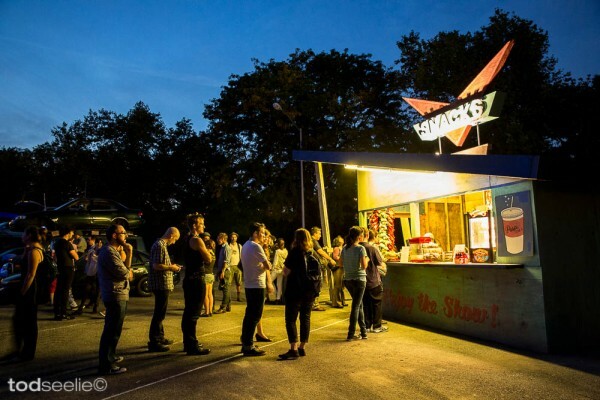 â€œThereâ€™s been a lot of talk about the tyranny of participation, and yet itâ€™s true that Claire Bishop and a lot of ideas about social practice have influenced some of our thoughts about Empire Drive-In,â€ remarked Chandler and Stark. There are several big, concurrent messages at Empire Drive-In. Perhaps this is an effect of it being a multivalent product of many collaborators, or perhaps it’s a resistance of reductive categorization. One thing is for sure: if all art-going experiences were this inclusive, a wider public might start to recognize themselves in the visual culture that represents them. Museums take note. 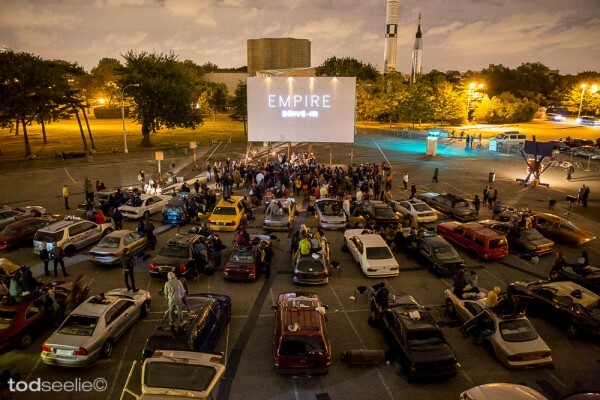 Empire Drive-In at the New York Hall of Science closes on Sunday, October 20.